The door to where law can be practised is wide open like the practice of law itself. At Queen’s Law, the Career Development Office (CDO) equips students with the tools to accomplish what they want to achieve and where they want to achieve it, whether it’s in a large urban centre or in smaller regions and municipalities. Warren WhiteKnight, Law’13, took full advantage of the CDO’s services and resources throughout his legal studies, and found that pursuing a small-market practice was the right path for him. Warren WhiteKnight, Law’13, has found professional and personal fulfillment in Kingston, where he teaches at Queen’s Law and has a thriving legal practice in a firm that’s been named one Canada’s top 10 personal injury boutiques. When Vermont-native WhiteKnight accepted his offer to the Queen’s JD program, he had never been to Kingston before. Shortly after settling in to his new home, he “fell in love” with the region. Now he has a thriving practice in the “Limestone City,” focusing on injury law and medical malpractice. 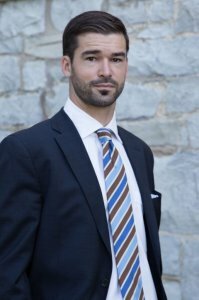 He’s as an associate lawyer with Bergeron Clifford LLP, a firm ranked by Canadian Lawyer magazine as one of Canada’s top 10 personal injury boutiques. Practising in a smaller market that is central to Toronto, Montreal and Ottawa, WhiteKnight explains, has all the benefits of work-life balance that one would expect while still providing the excitement of “big city” legal opportunities. “In Kingston, I am able to work on the same calibre of legal tasks that my Toronto and Ottawa colleagues do,” he says, noting how easy it is to travel by train to and from the bigger cities in order to attend courts throughout the Eastern Ontario region. As for practising in the city of his alma mater, he finds it provides wonderful opportunities to network with fellow alumni, which in turn has been a boon to his practice. He enjoys developing and deepening his ties to Queen’s Law as a volunteer, a mentor and since 2016 as a sessional instructor of an Alternative Dispute Resolution class. “I am truly privileged to get to return the favour of good teaching and mentorship,” he says. Rounding out his student experience, he sang in an a cappella barbershop group, All The Queen’s Men, and played pick-up soccer each day right next to the Faculty building. During his time at Queen’s, WhiteKnight found that the blend of highly structured and intensive study was nicely balanced with opportunities for unstructured fun and collegiality with students in law and other professional programs.